Blackstrap BBQ co-owners Chris Thompson and Kate Perry are both alumni of East Coast Grill in Cambridge. 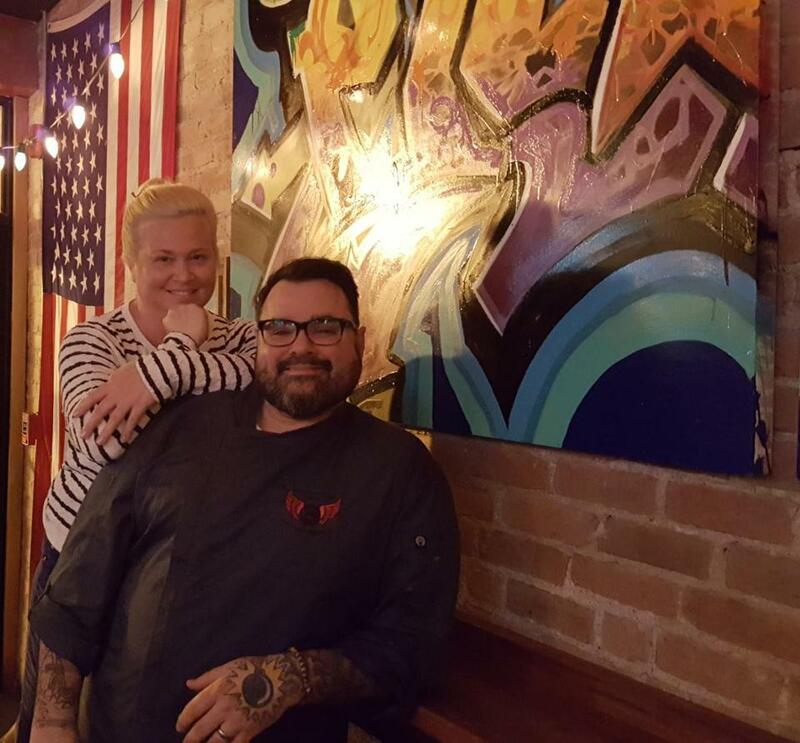 WHO’S IN CHARGE Chef Chris Thompson and Kate Perry, his business partner, co-own the funky Blackstrap BBQ in Winthrop, opened in 2010. The name comes from the blackstrap molasses used in many of the dishes. It was originally a tiny spot with 25 seats, but a bar area added in 2014 doubled the space. Bar manager Brian Kuhlen is behind the house-infused flavored vodkas and long beer/bourbon/whiskey selection. All three, alumni of the iconic East Coast Grill in Cambridge (Thompson was head chef of the catering unit), are fiercely dedicated to bringing that same flair and smoke to this seaside town. Their fourth partner stands silent: a 7- by 7-foot smoker, slowly cooking up to 750 pounds of meat over a blend of hickory, cherry, and local hardwoods. THE LOCALE Some might find the location out of the way, but not true barbecue lovers. “Barbecue has always been a destination. People seek out barbecue,” Thompson says. Lucky locals frequent the place, but many customers come from all over the North Shore and beyond. A younger 20-something crowd, which Thompson assumes comes from the Cambridge-Somerville area, has discovered this barbecue outpost, too. Loud music pours from the bar, some from Thompson’s own vinyl collection. The day-glo graffitied bar nods to his love of the urban art form. The dining area features driftwood art by a local artist on one wall, a dart board on another for Wednesday dart nights. ON THE MENU When I discovered the place, shortly after it opened, the tiny footprint housed a few tables, and lemonade and iced tea were served. You ordered, ate, then left. Now, I want to linger. The menu is longer — the libations list, too. 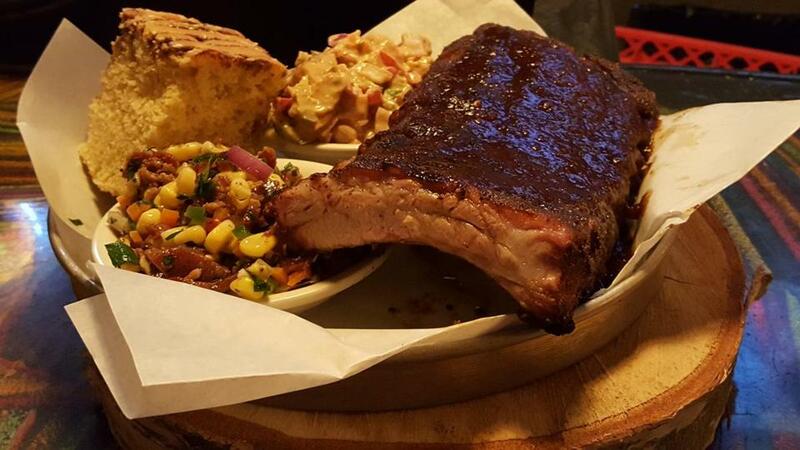 What’s remains is the staff’s friendliness and great barbecue that covers the bases from Memphis (ribs) to South Carolina and Eastern North Carolina (pulled pork), Texas (brisket), and Kansas (baby back ribs). Hungry to get reacquainted, we went whole hog. The smoked duck poutine ($13.50) is dream-inducing. Crispy french fries (that stay crisp) are topped with duck leg meat, quickly cured then smoked, and Vermont cheese curds melted till stretchy-stringy under a ladle of chicken gravy and a splash of truffle oil. Bravely daring the heat of Gram Kath’s “Rip Your Lips Off” chili ($6 a cup, $8 a bowl), we discovered our new favorite variety: no beans or tomato sauce. More like pulled pork, it’s a mix of shredded beef, pork, and chicken topped with Vermont cheddar and red onions. A hunk of cornbread absorbs the tingling pain. Orders of wings kept flying by, so we sampled six (six for $8, 12 for $14, 24 for $25). With seven flavors to choose from (including “hell”), we picked Buffalo (hot) and smoked peach chili glaze (a sweet-hot balance). Succulent and plump inside, the meaty wings were crispy outside, thanks to a three-part process: brine (24 hours), smoke (160 degrees), then fry. Ridiculously meaty Kansas baby back ribs (half $18, full $29, two sides and cornbread), a special Thursday through Saturday (or until gone), proved finger-licking good, in true Kansas City style, sticky and covered in sauce. Of the sides, all delicious, the corn and bacon salad is still a standout, a medley of whole fresh corn, bacon, and whatever Thompson grabs fresh from the organic Bay End Farm in Bourne. The Hog Plate ($13, with two sides, solo $9) is unbelievable. A footlong, bacon-wrapped kielbasa is double-smoked, the flavor permeating the skin and tender meat, then fried. Dessert? There is none. Besides, you won’t have room. Blackstrap BBQ, 47A Woodside Ave., Winthrop, 617-207-1783, blackstrapbbq.com. Kansas baby back ribs with sides of corn and bacon salad, sweet potato salad, and a hunk of homemade cornbread.